As part of the Fifth Edition of the Caravan Festival for Visual Arts that took place earlier this year, 25 works by various inter-generational artists in London will be exhibited in a London cathedral between 30 August and 20 September. One of London’s oldest and most iconic cathedrals, Saint Paul, will exhibit a selection of 25 of the Caravan Festival's donkeys out of the original 90 that were displayed in Cairo in May. 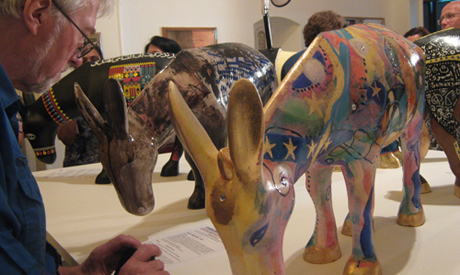 The donkeys are meant to symbolise peace and love and promote a culture of dialogue against violence and sectarianism. The project is supported by the Swiss Embassy in Cairo and the British Council. According to the press release, The Caravan exhibition follows in the footsteps of an approach to public art that has featured painted animals, with an added depth to the particular animal’s symbolism, intention and message. "The donkey symbolizes peace in both Christianity and Islam, and is found in both the Bible and in the Quran. Examples are numerous, such as both Jesus and Omar Ibn El Khattab, the second caliph, each riding donkeys when they entered Jerusalem," reads the release. "The donkey also represents the poor, as it is an animal of burden, and this is especially the case in Egypt." Among the Egyptian artists attending are: Adel Nassif, Adel Tharwat, Ahmed El-Kout, Ahmed Kassem, Ashraf Reda, Ayman El-Samry, Karl Homossy, Farid Fadel, Gamal Ezz, George Baghoury, Hayam Abdel-Baky, Hend Adnan, Ibrahim El-Dessouki, Karim Abdel-Malak, Khaled Hafez, Marwa Adel, Moataz Nasr El-Din, Mohamed Abla, Medhat Talaat, Rania Fouad and Sabah Naim, Sameh Ismail. The exhibition will include special presentations by two premier Muslim Egyptian artists: Reda Abdel Rahman and Mohamed Abla. Other participating artists will be present throughout the duration of the exhibition. The festival’s coordinator affirmed that their purpose is to deliver a message to the world that Egypt is a land of peace, especially in light of the recent violence and clashes. Following their exhibition at St Paul’s Cathedral, the donkeys will be auctioned off in London for charities in Egypt that serve the poorest of the poor, regardless of creed.